Following the launch of my blog, "Calling Dr. Larsen," I was very faithful to publish posts daily. 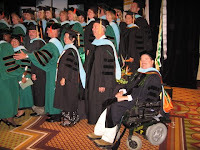 Over a week ago last Thursday I took a short hiatus to attend my hooding ceremony. It is a special recognition event for doctoral degree candidates during which faculty and University trustees place the doctoral hood over the head of the graduate, signifying his or her success in completing the graduate program. The ceremony is similar to a graduation in that faculty and students are dressed in academic attire. What an event! I am picking-up where I left off and will strive to keep-up the posts!